It’s a wonderful feeling when you drive a brand-new car away from the dealership. The feeling that you are “the first.” That new car smell. When it’s a shiny new aircraft pulling away from the gate at the Boeing airfield in Seattle, WA, it’s much the same feeling. Just one that’s magnified many times. 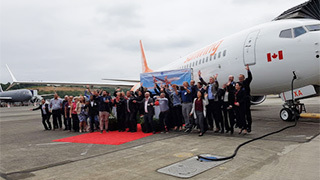 Open Jaw was there last week when Sunwing Airlines President Mark Williams and a handful of airline staffers and media member had the opportunity to tour the Boeing factory and board a brand spanking new Sunwing Boeing 737 MAX 8 aircraft, the first in the airline’s fleet. 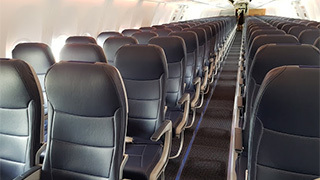 As with other Sunwing 737s it accommodates 189 passengers, 24 in premium seats including exit rows. (And yes, there is that new plane smell). The bird is the first of four for WG, part of a $350M deal. 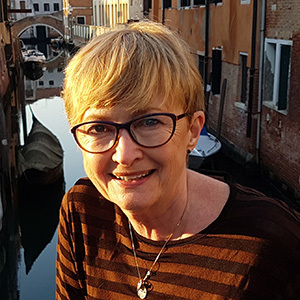 How will the experience be different for your clients? As so many pax now bring on board their own tablets and music, instead of traditional inflight entertainment the aircraft features USB ports – that charge, not just drain - at every seat. While seat pitch is unchanged, the seat angle is different, making the pitch feel 2” larger. Even my 6’3” seatmate commented on the comfort of the seats in mid-plane. Greater fuel efficiency means Sunwing Airlines can add longer routes and reduce its carbon footprint: carbon emissions are 20% lower than those of the aircraft it replaces. Aiding that efficiency are the aircraft’s distinctive V-shaped winglets. A more relaxed experience. Not only do pax enjoy a quieter ride, variable mood lighting can make for a more pleasant flight. Apart from the thrill of getting a VIP tour of the massive Boeing facility, one of the memorable aspects of the trip was that we flew home with the cockpit door open, which sadly never happens these days. 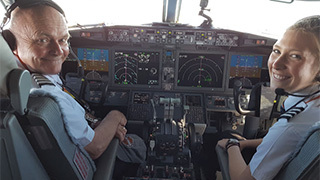 What a terrific experience, especially when the aircraft was piloted by the carrier’s most senior Captain Ron Henry (who estimates he has about 16,000 hours of flying under his belt) and First Officer Jessalyn Teed (the airline’s youngest and newest pilot, absolutely brimming with pride). Best of all, we weren’t too cool to applaud. On takeoff and landing. 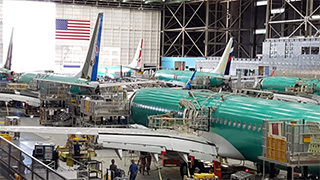 To see a video of how the new Boeing 737 MAX 8 is constructed, click here.